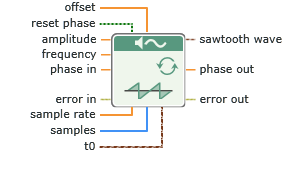 Generates a signal containing a sawtooth wave. DC offset of the signal. A Boolean that determines the initial phase of the wave. Initial phase in degrees of the signal when reset phase is True. Phase, in degrees, of the next sample of the output signal. If sequence Y represents a sawtooth wave, this node generates the pattern according to the following equation. where n is the number of samples. The node calculates sawtooth ( phase [ i ] ) according to the following table. where initial_phase is the initial phase of the wave.